Crocheted Matinee Jackets. 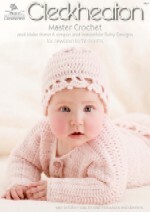 Your baby will be snug as a bug in one of these gorgeous crocheted jackets. 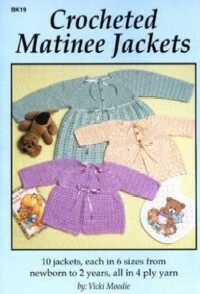 Vicki Moodie’s book shows you how to create 10 jackets in 4 ply yarn. 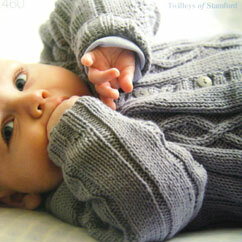 Keep your little ones warm with these gorgeous cardigan designs. 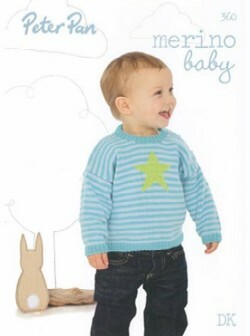 Edited by Vicki Moodie, Cuddle Cardigans offers a gorgeous selection of cardigans to knit for baby from birth to two-years-old. 34 classic afghans by popular designers. The warmth and softness of each is destined to charm wee folk and their moms for years to come, whether made as gifts or knitted for your own expanding family. Traditional patterns include ripples, chevrons, cables, diagonal elements, and lacy looks that knitters have loved for generations. 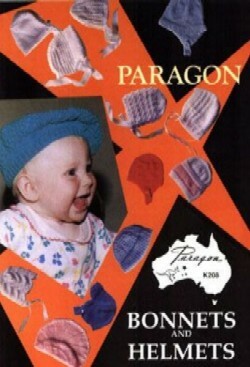 The designs are made using a variety of yarns in light and medium weights. All of the beautiful and fun-to-knit designs are shown in close-up photography and given with clear, step-by-step instructions. 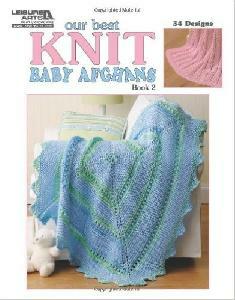 This book is a must-have for every knitter's library! 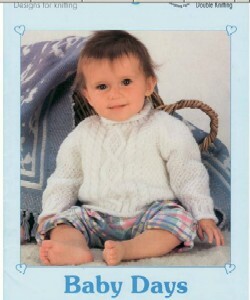 Turn your toddlers into tiny trendsetters with the sweet designs in Knit Celebrity Baby Fashion! Lisa Gentryís 9 designs make it easy to get the celebrity look from head to toe. 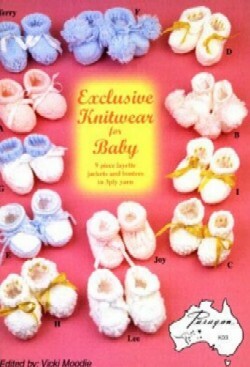 The designs feature various weights of yarn and all come in three sizes except the Small Lovie Blanket. 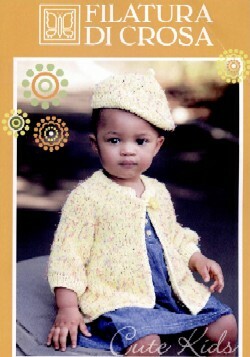 Slouchy Beanie, Hat with Flower, Newsboy Hat, and Poncho/Skirt offer sizes 3-6 months, 6-12 months, and 12-24 months. Leg Warmers, Cowl, Fingerless Mitts, and an Earflap Hat offer sizes 6-12 months, 12-18 months, and 18-24 months. 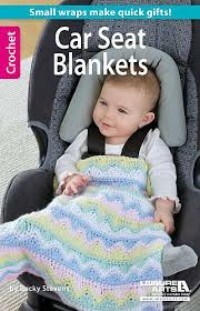 Keep little on-the-go legs warm when you use a crocheted blanket that is kid-sized! 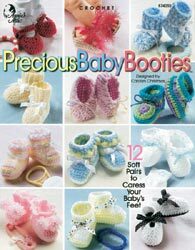 A perfect crochet solution for little ones traveling in car seats, strollers, and other carriers. Crocheted Outfits. 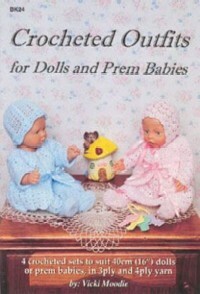 Vicki Moodie’s book offers easy-to-follow instructions on how to crochet four outfits for dolls or premature babies. 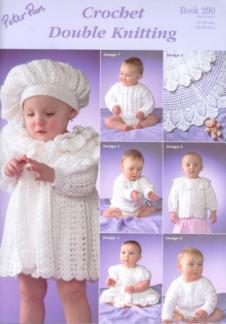 8 hand knit designs for babies from birth to 18 months, knitted in Filatura di Crosa Dolce Amore 4ply cotton. 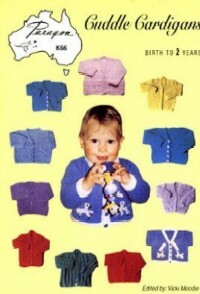 Sizes range from Premature to 18 months. Book contains 12 designs in total.